At Pro-Rehab, we handle the management of your accident while you get back to doing what you love most. PROCRASTINATING ON FILING A CLAIM? Call 302-265-3370 today to talk with one of our practitioners. No matter whether your condition was caused by a sport, work accident or otherwise, we welcome the chance to help you. "Dr. Sheehan and his staff are exceptional. They are always pleasant and accommodating." "Wow, just amazing. I feel great. I left the place walking without a limp. Thank you!" "Amazing doctors and office staff at Pro Rehab Chiropractic and Rehabilitation Services." "Knowledgeable Doctors and friendly staff. Helped my back pain tremendously." "Dr. Sheehan has been amazing. I highly recommend him if you need a chiropractor." 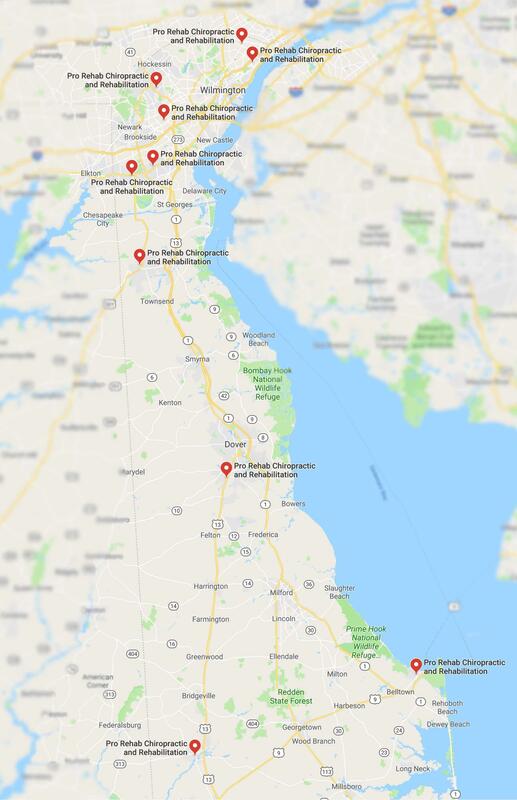 At Pro Rehab Chiropractic and Rehabilitation, with ten convenient locations across the state of Delaware, the team of skilled chiropractors is dedicated to providing patient-centered care with state-of-the-art rehabilitation technologies. They treat many conditions related to the musculoskeletal system, including spine problems, neck problems, and joint disorders. Whichever location patients choose to visit, they find caring, knowledgeable chiropractors who specialize in comprehensive treatment for work injuries, sports injuries, car accidents, and many other conditions that cause chronic pain. The chiropractic team at Pro Rehab Chiropractic and Rehabilitation strives to relieve symptoms as naturally as possible, using the latest technologies and treatments to improve each patient’s quality of life. They create customized treatment plans that focus on restoring function and mobility for acute joint injuries as well as chronic, debilitating conditions. The doctors rely on state-of-the-art diagnostic technology so they can isolate problem areas faster and more accurately than traditional rehabilitation methods. Individualized, comprehensive treatment plans often include a multidisciplinary approach to healing with complementary therapies that include chiropractic adjustments and therapeutic massage. Patients throughout the state of Delaware trust their spine and pain conditions to the expert chiropractic team at Pro Rehab Chiropractic and Rehabilitation. Pro Rehab Chiropractic and Rehabilitation is accepting new patients and looks forward to continuing to help people get long-term pain relief while improving their overall health and wellness. We accept all major insurance plans at Pro Rehab Chiropractic and Rehabilitation. If you do not see your insurance provider listed or if you have any questions about payment, please contact our office. "Dr. Sheehan has helped me tons. I went to Dr. Sheehan and told him my story and in 4 visits, my vertigo was gone! They are very friendly in the office." "I absolutely love Pro Rehab in Lewes, Delaware! The care and compassion from the staff I felt through the process of my treatments were remarkable!" "Not only is the technology he uses to fix your back amazing, Dr. Sheehan is also a super great guy. He helped me with two pinch nerves in my back in 2012." "Dr. Sheehan is a great and friendly doctor. He helped me with my back and hip problems. Staff is great as well. I highly recommend!" "Dr. Sheehan's methods have fixed my lower back pain, my son's sports injury pain, and my spouse's neck pain. It works!"